Its fun to “Make ’em” and then catch fish with ’em. 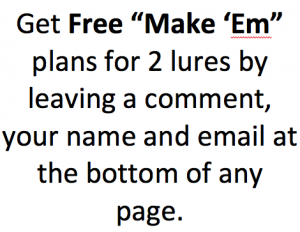 Leave an email in the comment section of any page and receive a free set of plans so you can make ’em. Fish hit by instinct not because of discernment. When what they hit isn’t food, they release it. With hooks involved, its too late. Anything you can create to imitate potential food or a potential irritant will produce strikes. As a kid, I lost lots of lures to submerged trees and unseen rocks. So, I decided to make ’em. I made the two types of lures that seemed to catch fish best. I used materials that cost nothing and were easy to find. That way I had free lures that were easy to make and that caught fish. is a cylindrical lure that is easy to make in different sizes and weights. It is great for bass, pike,walleyes and lake trout in any water conditions fishing on the surface to a depth of 10 feet. Small versions catch crappie, perch, bluegills and even trout. trolls at depths and is great for casting in water over 10 feet deep. It can easily be made in different sizes, weights and shapes. I have caught larger fish including bluefish, northern pike and lake trout on this home made job. These lures work as well as manufactured lures, but only cost pennies. Lure kits can be fun and productive. I created this website because I couldn’t find a fishing site I liked. 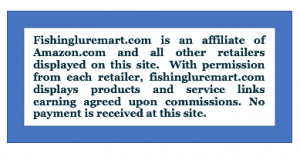 While you are checking out my home made lures, take a look at how I built this website. Click on a kit or the book to make a purchase. Or, click and scroll through dozens of books on fishing. To purchase any item, type that item into the search bar. Do you have homemade lures? Have you found a particularly good lure kit? Share it in the comment section below. Let am email address to get plans for the Marvelous Macaroni and The Brass Bomber FREE!. I have a cousin that makes his own fishing lures he has been doing it for years.. my husband and I have several of his lures and they work great. We tried our hand a making some once but we decided to leave the making to him. He mainly made spinner baits and fly fishing lures.